When visiting in-laws recently, we went to brunch in Chattanooga, TN. Since brunch is typically pretty easy to manage gluten-free (I've always been able to order an omelet and grits, hashbrowns or fruit), I wasn't concerned about the place we were going. And, for the record, it came up on the list of gf friendly places on Trip Advisor anyway. We arrived to a bustling restaurant and had to wait about an hour to be seated. Since we had time to kill, I asked the hostess about gf options. She was nice enough, but clearly knew nothing about what I could and could not order. She said she'd get back to me and after asking her again later, I was finally told they can't do an omelet (yes - they serve eggs). OK - I'll have to order scrambled eggs and I'll just ask for cheese and bacon in it. At least I won't starve to death. The server takes my order and he's pretty knowledgeable. He knows I can't have b'fast potatoes and isn't sure about the grits. I tell him I'll have scrambled, well done eggs with bacon and cheese mixed in. And, if I can't have grits - I'll have fruit. Nope - they don't have fruit. The poor server looked so concerned as he continued to try to help me find something suitable to eat. By now, everyone in our party of six was on the verge of being "hangry"...lol! I'm told before the food comes out I can have the grits. Well, that's good news, at least. Then the food is delivered and my plate looks fine (no unwanted toast on it). For reasons not explained, the bacon is on the side - not in the eggs. And the scrambled eggs are very runny...and have to go back for more cooking. I ate the grits (very good) and bacon and eventually my eggs. My food was fine, if nothing special. Being spoiled in the ATL is great as long as you're in the ATL! I wasn't expecting to order gluten-free pancakes or a cinnamon bun, like we can easily do here, after all. The rest of the party really enjoyed their food, though my husband thought his sandwich was small for the price. If you're wondering where we went - it was the Flying Squirrel. In their defense, they have pretty decent gf reviws for dinner - not brunch. My bad. The good news is that if you want an omelet for brunch or lunch when in Chat, you can have an amazing option at Frothy Monkey (the same chain as in Nashville). The gf bread and muffins there are nothing to get excited about, but they're decent enough. They do bake those in house so please keep that in mind before ordering. Either way, the omelets are amazing there! Anyone who loved bread when they could have gluten might still be looking for that perfect, normal tasting, I-can't-believe-it's-gluten-free-bread...and hoping the next brand they try will be it. Over the years, I'd pretty much given up ever finding the all-elusive perfect gluten-free bread. Carbs are really not my friend these days so I didn't feel I was missing anything. Recently, with the discovery of Jersey Mike's amazing sandwiches and my favorite freshly baked scones from Seven Sisters, I've enjoyed bread items more than in recent years. However, I still find myself letting sliced bread sit in the fridge too long....until it's almost petrified and has to be thrown out. Throwing out food of any kind is terrible and I try very hard not to ever do it. So, I rarely buy bread, but do splurge on bagels every now and then. Those freeze well and can be taken out the night before you need one and for me, that means much less waste than sliced bread. For my birthday last year, we went to Scotland for the first time. To say the trip was amazing is an extreme understatement. We went in the warm season - July - making sure to pack like it was winter in the ATL. Yes, we needed gloves, hats, coats, scarves and of course - heavy duty umbrellas! More about the trip later. The point of this post, which is dragging on unnecessarily, is to share the best gluten-free find I've had - EVER! Rumors about Genius bread surfaced many years ago, but it was the brand of the bread sold in many parts of Europe. What I didn't realize at the time, is when it was introduced in the US, it was not (in any way shape or form) the bread that everyone who'd had it in Europe had raved about. In fact, I could not believe anyone would think the bread was any different than your standard, oddly textured, frozen bread we've all become accustomed to. Eventually, I found out all Genius bread is not created equal - to say the least! Fast forward several years when I walked into a Sainsbury's in Edinburgh and found Genius bread sitting on the shelf - NOT in the freezer, mind you - in the 'free from' section. Strangely enough, because the bread was as light as a feather AND it was a huge loaf, I immediately assumed that it was regular, gluten containing bread. Seriously - that went though my mind even though the bread was in the 'free from' section. That's where allergen-free products are found in many countries in Europe. They don't mix everything up like so many stores here do. OK - so there is a light loaf of bread that is labelled gluten-free. The size of the slices is "normal" making it all the more confusing. It's hard to wrap your brain around something you didn't know could, or did, exist. It was...well, it was a gluten-free miracle of sorts. We picked up some basics like eggs, cereal, fruit, cheese, wine, milk and various 'free from' snacks like mini tarts (yum!) and made our way back to our fantastic Home Away apartment. Our plane had arrived just a few hours before so it was time for lunch. Naturally, I decided to have a piece of bread with butter on it along with a grilled chicken salad. It was love at fist bite for the REAL Genius bread. Even still - I literally ran into the kitchen to read the label on the bread bag again! At this point, you feel as though you're losing your grip on reality. How many times do I have to read a label to believe the bread, as inconceivably delcious as it is, is in fact, GLUTEN-FREE? Enough already - get over it and enjoy it! And that is what I did for the entire trip, even savoring the last slice at the Edinburgh airport, before heading home. It wasn't until after I got back to reality - the one where no amazing gluten-free bread is on the shelf at my local grocery store - that I began to question why that was. More on that another day. For now, please know that if you are anywhere outside the U.S. that sells Genius bread - BUY IT!!! You won't like it - you'll love it and then you'll be dissappointed that you can't find it anywhere in this country. The only upside is that if this bread was at the store around the corner, I would have a very hard time sticking to my self-imposed low carb diet...lol! Over a year ago, we started picking up take-out from Burger 21. They have gluten-free buns as well as gluten-free fries (regular and sweet potato) made in a dedicated fryer. And if you dine in, they have a nice gluten-free cider. Since the bright indoor lighting is rather jarring if you're sensitive to light, we went from dining in to picking up take-out fairly quickly. However, over the last six months or so, our orders often haven't been made right. Thankfully, my meal was still gluten-free, but the bacon we paid for was not on the burger. This happened three consecutive times. Finally, we complained (via phone) and the next time my husband went in, they gave him a free burger on our take-out order. Unfortunately, even though my burger had the bacon ordered on it, it also had lots of condiments and other stuff I do not eat on burgers. It was completely gross so we had to go back and exchange it for another burger. We got more coupons for that mistake, but by then I was thinking I don't really care about saving on an order if the restaurant can't seem to prepare it correctly...over and over again. Finally, another take-out order and again, it was prepared incorrectly. But this time my husband knew to check the order BEFORE he left and sure enough, there was stuff on my burger which was not supposed to be on it...and the order taker definitely confirmed the other back correctly before sending details to the kitchen. So, now we assume someone in the kitchen can't read the tickets....or they're snap chatting with someone or taking selfies...whatever kids do these days...lol! Whatever the issue, they're absolutely not concentrating on getting orders prepared correctly. Now my husband won't go back and since he's the official take-out guy at our house, I'm kind of out of luck. By the way, Burger 21 burgers are fine and the fries are very tasty. But the gluten-free buns and burgers at Cheeseburger Bobby's are better. I can't have fries there due to no dedicated fryer..hence our past tendency to get burgers from Burger 21, unless I'm not in the mood for fries. Beware of gluten-free menus - even more than before! The amount of restaurants that now have gluten-free menus is staggering and many offer incredible options that are safely prepared (as much as is possible in a mixed kitchen). But the number of menus that list fried items that are not made in a dedicated gluten-free fryer seems to be on the rise. Forget chips and fries - I'm talking about even gluten-free breaded items in some cases. The good news is that many places will denote on the menu that the items are cooked/fried in a regular gluten fryer. The bad news is that most of us can't take the risk of getting sick, and therefore must avoid those items. In some instances, avoiding those items will leave you with few safe choices on the menu. And at least in my case, that's not a place I'd bother patronizing. So when you're doing your homework, looking for gluten-free options at your neighborhood or on your dream vacation, pay great attention to the little things regarding food prep, etc. It's not only about the ingredients. It's not even about those and the preparation methods. It's about the plating after everything has been done to prepare the meal correctly. One line cook tossing a piece of bread ruins the whole darn thing. Years ago, I watched someone throw a roll on my plate at Ted's Montana Grill. Someone yelled "no bread gluten-free" quite loudly. The roll was quickly removed and they brought out the plate as though nothing happened. They had no idea I'd seen the whole thing from our table. I explained that I could not eat anything on the plate now and I'd take just a baked potato. We didn't have the time to wait on another steak...and I really had no trust in the place at that moment. I think Ted's has improved greatly since then, but it's not a favorite because of the incident years ago. What many companies don't understand is that it's hard to forget simple mistakes, because those mistakes can take us down for the count. If you get the feeling a place doesn't take gluten-free orders, or food allergies, seriously, it's hard to shake that feeling no matter how much you'd like to. Restaurants that don't understand how to feed us safely would be better served to do away with their gluten-free menus altogether. And the places that do get it, and care about our business, are the places we all need to support as often as possible!. Best fresh gluten-free bagels ever! OK - I'll admit that I've had VERY few fresh gluten-free bagels, period. Even so, I'm reviewing what I think is the best gluten-free bagel, of any type, I've ever had. It was the kind of amazing experience that makes you say "I can't believe it's gluten-free!" and "I think I might cry" when you taste a chewy, real-tasting bagel the first time. I was recently in the Washington, DC area for work so I got to sample some amazing gluten-free things specific to that area. While pretty much everything I tried was astonishingly delicious, the Everything Bagel from Rise Bakery was good enough to be fearful that it was not gluten-free at first bite! Of course, everything at RISE is in fact, gluten-free. Therefore, there was nothing to worry about. Rise offers many wonderful things (like eclairs and croissants! ), most of which I was not able to sample this time around. This gluten-free gem will be my first stop on my next visit to DC...but I'll likely be ordering some of their amazing bagels well before then! Rise Bakery gladly ships to all 50 states in the USA! Everyone who has to follow a gluten-free diet has someone (or multiple people) in their life that is under the impression that doing so these days is super simple...or at least, it's not that hard. Why would anyone think such a thing? To understand, all you need to do is take a look around your basic grocery store and it will become clear. Companies have slapped gluten-free on pretty much everything they can think of - canned pineapple, salt, cornstarch - you get the drift. Let's go back a decade (yikes! no one knew what gluten-free meant back then in the USA) and think about how much has changed. From dressings to marinades to spice packets - it seemed everything contained gluten in the form of wheat. Nowadays, many such items are not only gluten-free, many are labeled as such. You can't get too far down the shopping isle without seeing a gluten-free product - or ten. Even mayo has fallen into the ridiculous items that are marked gluten-free, when the exact product I'm referring to in fact, never ever contained gluten. I even had a friend remark years ago that since X brand of mayo was now gluten-free, she was going to switch brands. Yes - that really happened...lol! While there are many more gluten-free replacement items available, that doesn't mean we have many delicious choices for any of them. Have any decent, soft, flavorful, fresh (not frozen) gluten-free bread lately? Not if you didn't get it from your local gluten-free bakery. Think that bread you found on the shelf was not previously frozen? More often than not, if you're in the USA, you'd be wrong about that. The same goes for the cupcakes, brownies or anything else you might find in a "traditional" bakery area of a store. Just ask the staff and they'll tell you those items come in frozen. There are a few things you might find that are fresh like fudge made in-store. But most people are too sensitive to eat fudge made in a bakery with gluten flour flying around. Even the items in the refrigerated bakery section were sent in frozen. People are always telling me about some place that has gluten-free pizza. They're usually excited to share this news, but not once has the place shared had decent gluten-free pizza. Who wants to eat pizza that tastes like cardboard? Same goes for pasta. Don't get me wrong, I appreciate friends (or acquaintances) that are thoughtful enough to tell me about a gluten-free menu they found out about, etc. It's great that people are kind enough to do it. And of course, they have no idea that said place possibly has terrible food and/or service regarding gluten-free options. We decided to grill hot dogs recently and I had to go to THREE stores to find gluten-free hot dog buns. And, I had to buy a brand that was not my first choice at that. Starbucks just dropped their gluten-free breakfast sandwich and we were all in tizzy over it. It wasn't any good to start with so this was understandable. We were likely upset because we always feel like we're being dissed for having to be gluten-free because...well...we are. It's just not true that being gluten-free is as easy as pie...at least, not in this country. And if anyone you know thinks that's the case, you might do well to inform them that they are quite mistaken. Many companies churn out gluten-free replacement products that are not good (some are literally inedible) on a regular basis, and think we should be happy to have them. Additionally, we live in a country where food allergies and intolerances are made fun of on a daily basis and it's simply disgusting. Let's all do our part to set the record straight. We can all appreciate how far we've come in the last decade, of course, but we're far behind many other countries on this issue. And as far as I can tell, history tells us that will continue possibly forever. 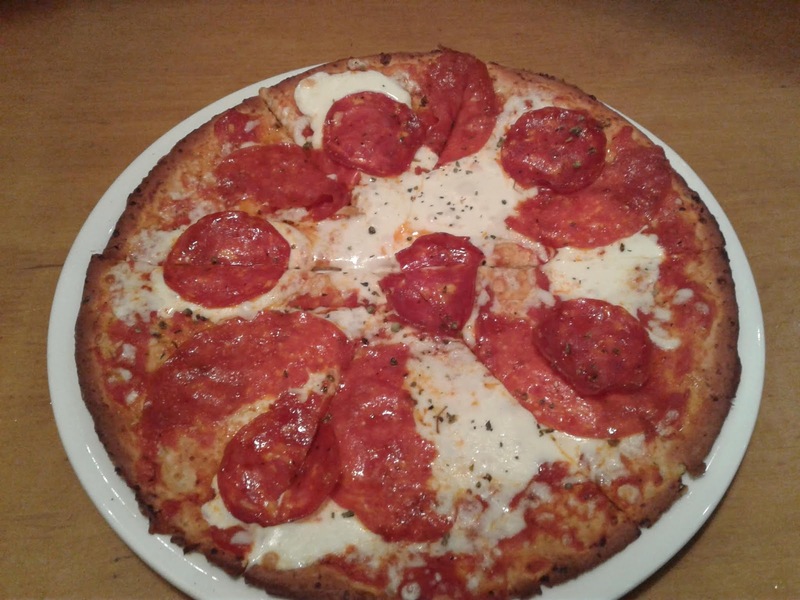 CPK's gluten-free pizza - third time's a charm! Once upon a time, California Pizza Kitchen (aka CPK) introduced a gluten-free crust. And, it was the worst I've ever had in a restaurant. Eventually, it became evident that the crust was a HUGE miss for the company and they made the smart decision to 86 it....offering an excuse about retraining the staff, etc. But my guess is that the gluten-free consumer's disgust over the taste of the rock hard crust was the real reason behind the dismissal of it. The fact that no one went to the ER due to cutting themselves while trying to cut this horrid crust is honestly shocking. Moving on...at some point, CPK introduced a "new and improved" gluten-free crust. It might have been new, but it wasn't exactly improved...it was just different. The second crust was almost the complete opposite of the first offering. Still with NO flavor whatsover, this crust was like soggy bread and nothing like a pizza crust. As far as I know, that crust is still available and for those who enjoy it, that's great. I would not eat it if it was free since to me, it's nothing like pizza should be. Finally, due to a lunch outing with a non gf friend, I had to find out what I could order at CPK. I was not planning on ordering a pizza, of course, but the salads at the place are usually quite delicious. To my great surprise, I came across this review of the new gf cauliflower crust at CPK. It peaked my interest enough to check out the pizza before the lunch outing with my friend. That way, if I didn't care for the new crust, my husband would eat it. He'll eat pretty much anything and is not a super taster (food snob) like me. We ordered the BBQ chicken pizza on the cauliflower crust (you must specify if you want that crust since there are two gf options now) to-go and it was ready when we got to the restaurant. It's a smallish pizza, like all gluten-free options in the ATL, but with a salad, it's plenty for two people. The crust was thin and looked different than the gluten crusts at CPK, and different than the last gluten-free crust I'd had there. Well, shut the front door - the pizza was delicious! The crust was like a regular thin crust pizza. Seriously, I think you could serve it to your pickiest "gluten-free food is yucky" friend and they'd never know the difference! My husband started wondering if the pizza we'd picked up and were eating was in fact, gluten-free - it was that good! Please don't misunderstand - CPK's cauliflower crust pizza is in no way shape or form, the best gluten-free pizza I've had. It's not as good as Blue Moon Pizza's gluten-free crust before they changed it (or the way they bake it). And it can't hold a candle to the wood fired option at Don Antonio (Atlanta location closed, sadly). But the new gluten-free pizza at CPK is not only edible - something neither of the first two options offered there were - it's actually worth eating! The only complaint I have about the pizzas are the limited offerings on the gluten-free crust. There are only four options, presumably due to cross contamination and/or ingredients used in the many other pizzas available to customers who can enjoy the regular crust. That's annoying, but I must admit, CPK's third gluten-free crust is definitely a charm! Photo above is the pepperoni gluten-free cauliflower crust pizza my non gf friend ordered. She really liked it, and thought it might have been the regular gluten crust, by mistake...told you it was wondeful...lol! 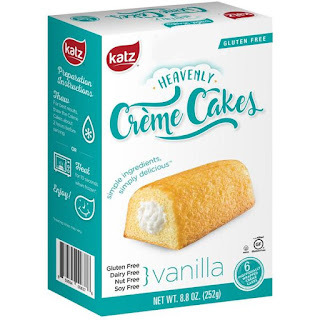 As gluten-free products in the U.S. change and improve, the list of my favorite finds does the same. 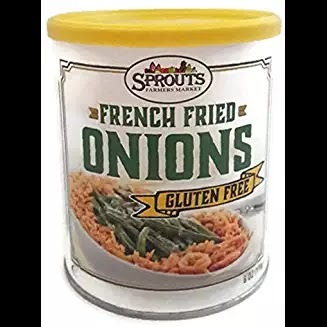 Many of my past favorite things are no more - Glutenfreeda cookies and Amy's Potato Leek soup, for examples - but at least new and amazing items continue to roll down the gluten-free pipeline. Please note this list is comprised only of items I can buy locally, though many fantastic products are sold online that are not available in the ATL. The * denotes where I've found listed items. Most are available are more than one place so be sure to find which store near you carries them, on the individual manufacturers' websites. If something says one particular flavor "only", it just means that is the only flavor (or flavors) I personally care for. To find the above items (if you haven't yet, but would like to), there are a few things to keep in mind. The Lucky Spoon cupcakes are shipped frozen, but put out in the "fresh" bakery section on a special dietary needs display in Sprouts. Tate's cookies have their own display at BB&B, but you must pay attention not to grab the green (gluten) bag. The gluten-free cookies come in a white bag. Also, the chocolate chip version of these cookies are absolutely horrible to me...odd to say the least. Sprouts stocks all Canyon Bakehouse goods in the refrigerated cooler in the bakery - not in the freezer. Lastly, the Trader Joe's Egg Fettuccine is stocked in the strangest place imaginable. It's above the produce...yes, I said produce. And due to the way it's laid flat, you can't even see the label. At least, it's that way at our TJ's. It's unbelievable how my friend, Jamie, ever found it and was able to tell me about it. But, I'm really grateful that she did! 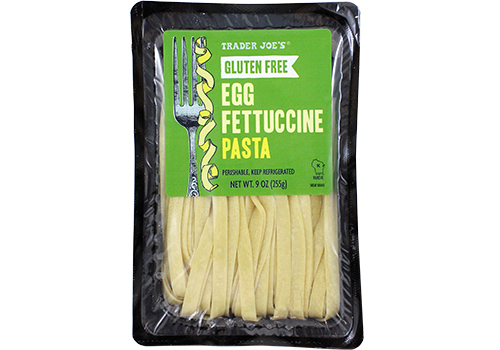 This pasta is also offers the most value since it's $3.99/pk for FRESH gluten-free pasta.